Are the kids ready to go for a spin? The Carousel in Saratoga Springs' Congress Park is a historic wooden carousel that has all the charm of yesteryear with all the enjoyment of today. The carousel usually opens for the year in early May for weekends only, until the school year ends in mid to late June, then operates daily from late morning until dusk. After Labor Day, the carousel returns to weekend-only hours. For just a buck per ride, you can keep the kids entertained and snap some really great photos for your brag book! And who could ask for a more beautiful setting than Congress Park? Stay tuned for updates about the 2019 operating schedule! So the next time you are out in Saratoga with the little ones, take them for a treat that is sure to please - the Congress Park Carousel. Kids love it, and you might just find yourself enjoying it too! 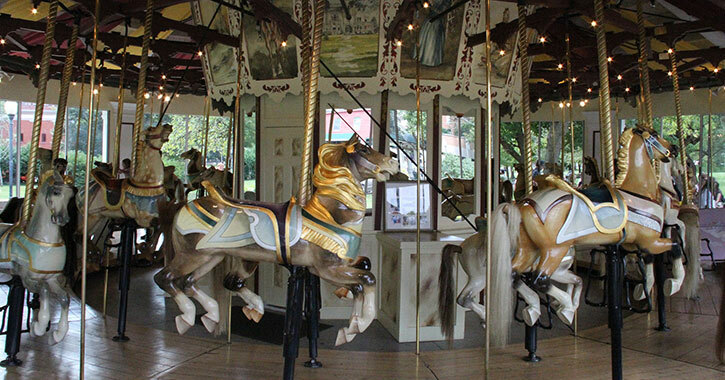 Call (518) 587-3550 x2555 for additional details on hours, rain dates, and other information on the Congress Park Carousel.